F. S. DELONG.F. married Ella SYRON. Ella SYRON [Parents] was born in 1860 in NY. She married F. S. DELONG. Kenneth B. SYRON [Parents] [image] was born in 1901 in NY. He died in 1962. He married Hazel E. GODFREY. Hazel E. GODFREY was born on 15 Feb 1901. She died on 10 Jan 1994. 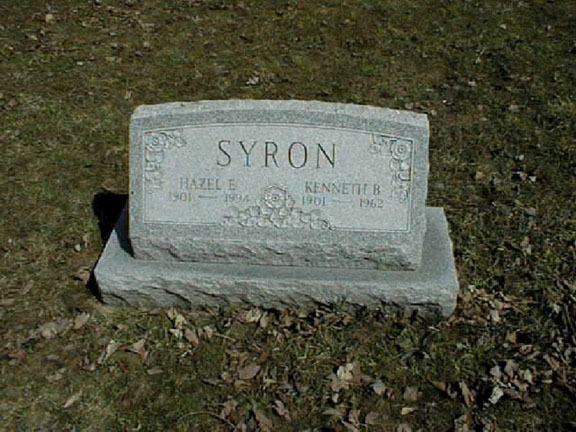 She married Kenneth B. SYRON. Frances M. HILL was born in 1851 in OH. He married Anna Elmyra SYRON on 23 Feb 1911 in Ludington, Mason, MI. Anna Elmyra SYRON [Parents] was born on 2 Jan 1867 in NY. She died on 23 Mar 1945 in Scottville, Mason, MI. She married Frances M. HILL on 23 Feb 1911 in Ludington, Mason, MI.